Battle of Actium (31 B.C.) - The Republic was already finished by 31 B.C.. The Battle of Actium was not fought to determine whether the Roman Republic would live or die; it was fought to determine who, Octavian or Antony, would rule. Why was Actium a naval engagement as opposed to Pharsalus, which was a land battle? Two reasons. First of all, the war be between Julius Caesar and Pompey was a localized struggle. Both men operated out of Rome, although the fight did migrate to the Greek peninsula when Pompey fled Italy and Caesar pursued. By contrast, Octavian was in Rome and Antony in Egypt, with the vast Mediterranean Sea separating them. As a result, ships were bound to play a role in their conflict. But more importantly, even though Octavian had no fear of an invasion from Antony, as long as he lived, he was a threat, and Octavian was eager to eliminate that threat. Octavian was the aggressor and Antony was the defender. This allowed Antony to choose the battlefield and he chose the sea. His decision was based on Cleopatra's advice that he had the advantage at sea, even though his generals preferred a land battle. Indeed, Antony had more ships and they were larger than Octavian's. However, larger does not necessarily mean better (as we shall see). The battle was fought on September 2, 31 B.C.. Antony's fleet took up position off the west coast of Greece, near the promontory of Actium, which enclosed the Gulf of Ambracia. He started with close to 500 ships, about half of which were heavy warships called quinqueremes (because they had four rows of oars) which were equipped with bronze armour plating. 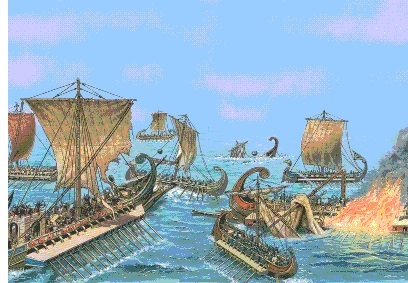 Octavian joined the battle with 400 vessels, but his were much smaller biremes (two rows of oars) called Liburnian ships. Despite what appeared to be a significant advantage for Antony, he suffered from two major disadvantages. First, some of his ships were undermanned. Dio Cassius records that a malaria outbreak had incapacitated many of his troops. Large ships such as quinqueremes were slow and difficult to maneuver even with a full compliment of sailors. Undermanned, they could be downright sluggish. Second, one of Antony's generals, Quintus Dellius, defected to Octavian's side before the battle and had full knowledge of Antony's strategy. When the battle was joined, the two sides fought for hours before anything was decided. Antony's slow ships were unable to ram Octavian's more maneuverable ones. But Octavian's smaller ships could hardly penetrate Antony's large armoured hulls. Then, late in the day, two significant events transpired which ultimately decided the outcome. First, Cleopatra fled the battle, along with her 60 ships. The reason is not fully understood other than that she may have panicked and retreated prematurely. But even more inexplicable is what happened next. When Marc Antony saw this, he broke off and followed, and took 40 of his ships with him. The sudden loss of 100 ships spelled doom for those that were left behind. Actium resulted in a decisive victory for Octavian. And the suicides of Antony and Cleopatra the following year meant the reason for their sudden retreats died with them. Three years later, Octavian had become Augustus Caesar and was the first official emperor of the Roman Empire.